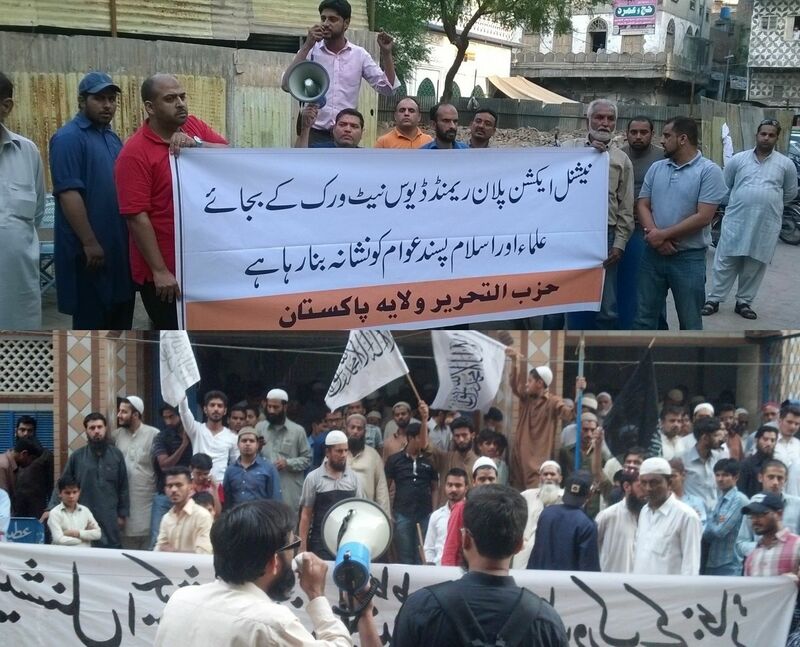 Hizb ut-Tahrir in the Wilayah of Pakistan held demonstrations across Pakistan against National Action Plan. Participants held banners and placards declaring “Instead of Stopping the Raymond Davis Network, National Action Plan is Persecuting Ulema and the Islam-Loving People” and “America’s Raymond Davis Network is the Cause of Insecurity in Pakistan”. The Raheel-Nawaz Regime used Peshawar school massacre as an excuse to target Ulema and Islam loving people in order to put an end to Jihad in Afghanistan and call of implementing Islam in Pakistan. Masters of Raheel-Nawaz regime sitting in Washington are scared of the return of Islam as they have seen that how Muslims across the globe act swiftly on every issue regarding Islam and its Ummah and the Muslims of Pakistan are always in forefront. So they have ordered their agents, traitors in the political and military leadership, to follow, terrorize, detain, abduct or even kill every soul which dared to challenge American Raj in Pakistan and want to wage Jihad against her in Afghanistan. Hizb wants to make it clear that the source of instability, bomb blasts and killing is the presence of America which is no doubt is the enemy of Pakistan and unless her footprints in the form of C.I.A and Raymond Davis network are not erased people of Pakistan won’t be able live a peaceful life. Through bomb blasts and killing America wants to establish that her war against Islam is actually our war and Raheel-Nawaz regime is actively supporting her plan in achieving this objective. Protestors demanded from the sincere officers of the armed forces that they must extend support for the establishment of Khilafah, the shield which will uproot every sign of American presence from Pakistan and Afghanistan. And this is the only plan, establishment of Khilafah, which will bring peace and stability in this region.